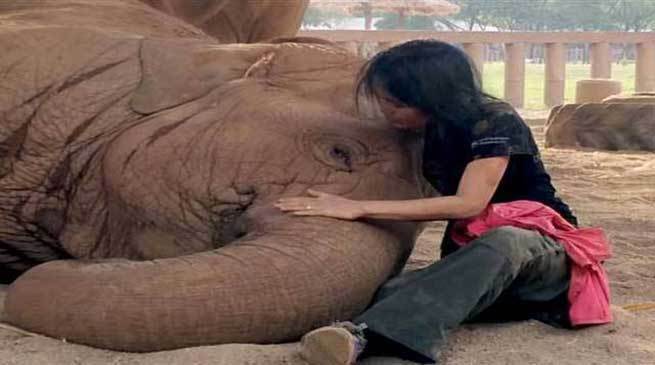 Stories of friendship between man and animal are many but the story of Leek Shailrat and her elephants from Thailand will still manage to amuse you. Shailrat sings lullabies to her elephants and her magical voice makes them doze off in blissful sleep. This instance captured in the video isn’t the first time she has made her pet elephants doze off, rather she has been doing this for years. The elephant, affectionately named Famai by her owner falls asleep every time it hears shailrat’s magical voice. The elephant first embraces the woman with its trunk and then slowly sits down on its knees before falling asleep while the woman sings lullabies during the entire time. She also chases away any fly that comes near her elephant with a piece of cloth in her hand. The woman has been living with elephants for many years now and has assisted in every conservation initiative aimed at elephants so far. It has also been rumoured that the woman is an elephant whisperer, being able to understand their language, an ability which has also become the subject of several documentaries.